Do You Know Your Email-Marketing Number? ING — a provider of retirement and insurance services — is currently running a great marketing and advertising campaign to get consumers to know the level of savings they need to retire. They lead with “Find Your Number.” In one of their television ads, for example, a guy asks his neighbor what his number is. The neighbor responds, apprehensively, with “a gazillion.” The point of the commercial is that if you don’t know your goal, you’ll never reach it because you don’t have a plan. It’s the same with email marketing. So, what’s your email-marketing number? Determining your email-marketing goal may at first seem daunting as there are so many variables affecting email performance. Here I provide a quick way to think through the process to find your email-marketing number. In email marketing, we see so many people working tirelessly to get their emails out the door, but not getting the results they want. They may tweak their subject lines or the design of their template, but they often don’t know what goal they’re trying to reach, so they aren’t being as systematic as they could be to reach their number. So, we recommend the following. 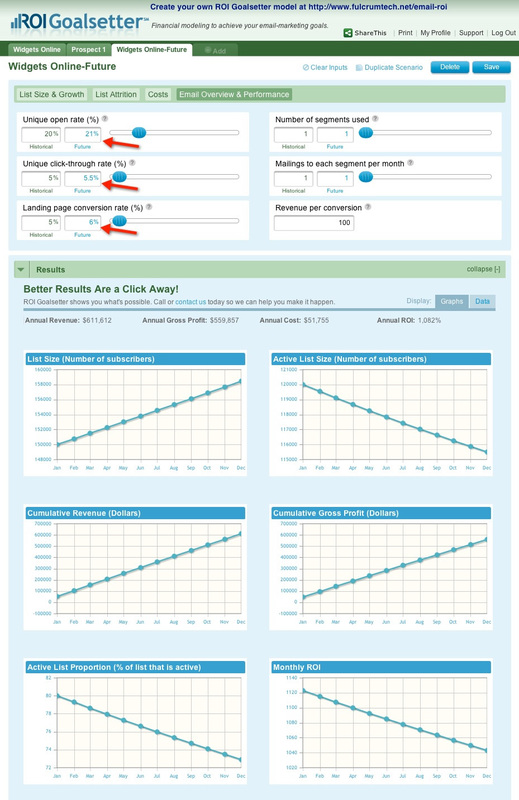 First, clarify the primary definitional and performance metrics of your email program, such as list size, list growth, average unique open and total open rates, average click-through rates, conversion rates, and value of conversions. 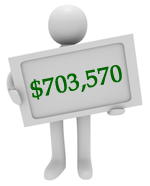 Next, determine what your current metrics deliver with respect to revenue and return on investment (ROI). 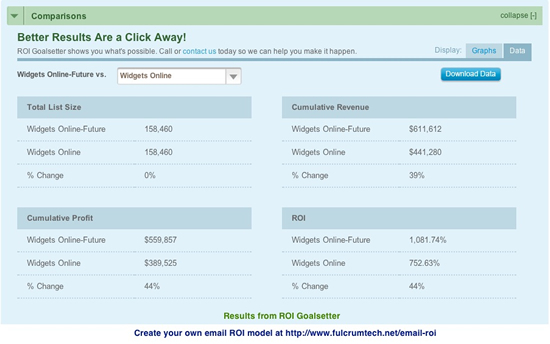 You can create a spreadsheet to figure this out or use FulcrumTech’s email-marketing ROI calculator and planning tool, ROI GoalsetterSM. 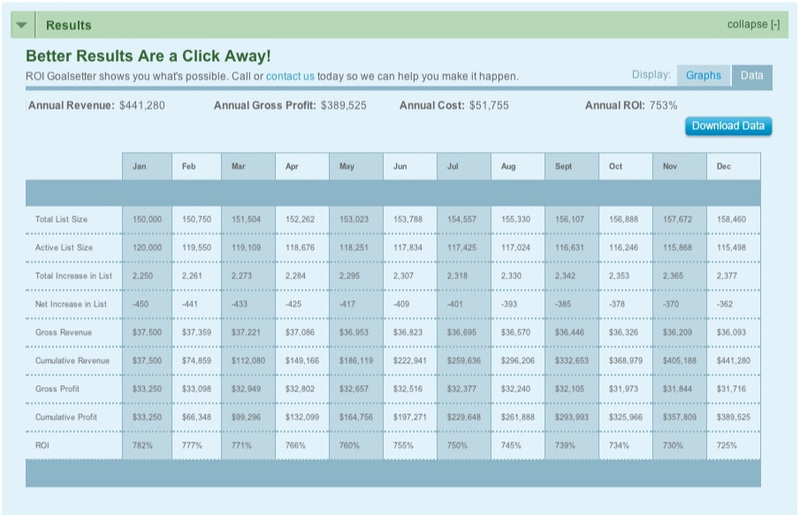 With the ROI Goalsetter tool, you can easily record and save your current assumptions to create a financial model of your email efforts for the next 12 months. This clarifies your current baseline. See the example below, in which we set up a number of assumptions, resulting in total annual revenue of $441,280, a profit of $389,525, and an ROI of 753%. Once you have an idea of what number makes sense, you now need to figure out what it will take to get you there. 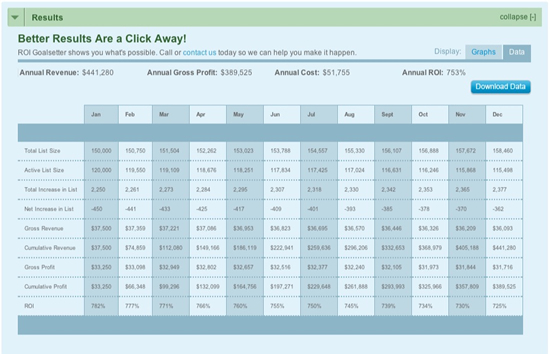 Again, you can create a spreadsheet to work this out, or you can use the capabilities of the ROI Goalsetter tool to duplicate your base case model, save it as your future case, and then begin modifying the variables to determine what it takes to get to your number. You’ll be surprised at what a few small, incremental improvements can have on your email-marketing results. To continue with our example, we created a future scenario and made changes to just three performance metrics. With these changes alone, revenue jumped to $611,612, while profit and ROI increased to $559,857 and 1,082%, respectively. 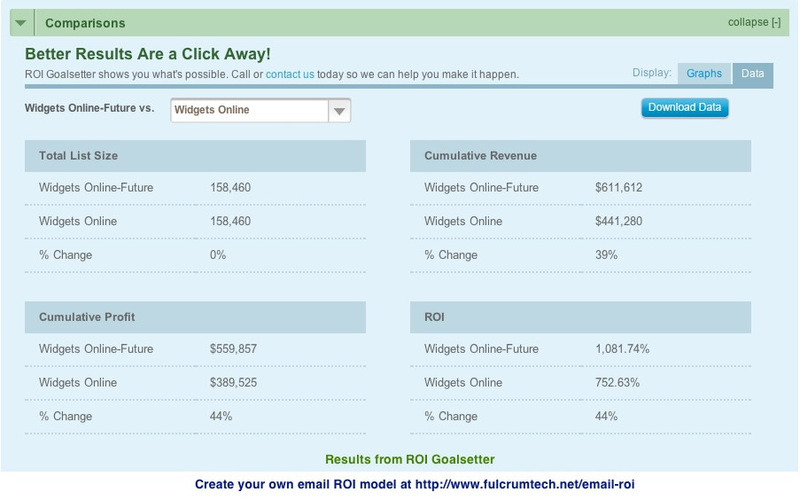 See the results below as calculated using the ROI Goalsetter tool. As noted in the comparison section at the bottom, we’ve achieved a 39% improvement in revenue plus a 44% increase in profit and ROI! So, what’s your number, and what will it take to get there? If you need help figuring out your “email-marketing number” or how to get there, give us a call at 215-489-9336 today. FulcrumTech is an online marketing agency that provides strategic guidance and the expert team to design, develop, and implement online marketing programs that exceed your goals. We have the experience needed to help you create goal-oriented strategies that make sense to your company and customers. NewsLever is our free, monthly e-newsletter for B2B and B2C professionals who want to develop and implement powerful email-marketing campaigns that build relationships with prospects and customers. Send me announcements about new content, upcoming webinars, and service offerings. Copyright © 2019 FulcrumTech, LLC. All rights reserved.